Your child’s playroom is the one room in the house where you can let your imagination run riot. From bright, funky colors to wonderfully themed wallpapers, there are many ways you can be creative. So where to start? Here are some ideas you might find useful. Before you make a start on the room remember one important thing. This isn’t your room! You are designing it for your children. You might want to let your inner child cut loose and design everything your way, but you need to compromise. What are your children interested in? Superheroes are the in thing at the moment, but your kids are guaranteed to tell you what they want in no uncertain terms. As far as is practical and affordable, create a room that suits their imagination. The room needs to be child-friendly. While carpeting will be soft on your child’s feet, it may not be the most practical choice. Instead, you may consider laminate flooring. This is ideal as you will easily be able to mop up any drink spills your child makes. Another flooring idea is rubber tiles. 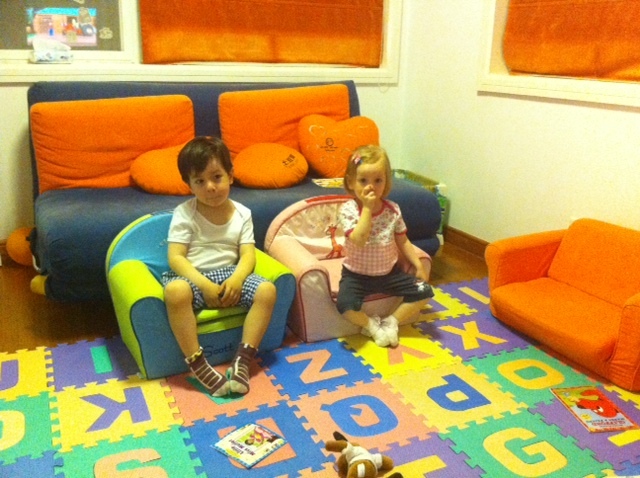 There are many colorful and themed designs dependant on your children’s age, and it will be comfortable underfoot too. Older children will be keen to invite their friends over and hang out. Therefore, consider seating, from beanbags to inflatable chairs. Sofa beds are also a good idea as they are perfect for sleepovers. A playroom needs somewhere to store toys and books. You can purchase brightly colored bookshelves and storage boxes that are good to look at as well as being practical. You should also color coordinate them with the overall look of the room. A moveable trolley is also a helpful solution when space is an issue. Remember to be safe. Your child needs to be able to reach their belongings, so don’t store toys on high shelves, and where possible attach storage units to the walls. You can add to your child’s learning in your storage. On each toy box stick on an appropriate picture so your child can quickly access the toys they need. For example, a picture of a car or a Disney character on appropriate boxes will make it easier for you and them to find what they are looking for. Of course, getting them to put their toys away in the right boxes is another matter. Play is one way your children use their imagination, but you should also consider their creativity. Should you have space, create a designated area for whatever they are interested in, from reading to painting, as well as a homework corner. You should allow them to use their creativity in the design of the room, so have one wall that can be used as a blank canvas. Using paint or chalk that can easily be washed away, this is the perfect place to let their artistic imaginations flow. Remember, your children will grow and their tastes will change. You will need to be flexible and adapt the room accordingly. Throwing a baby show for a friend is one of the greatest, heartfelt gifts you can give them. It’s a rite of passage for many women, who are pregnant for the first time, and what better way to celebrate an upcoming birth of a baby, than crossing the line into womanhood surrounded by friends. But this in itself, poses a huge challenge for friends and family, as the challenge is to differentiate your party from every other baby-related gathering or celebration. Luckily there are a few common codes of conduct that are flexible enough to give you creative control and allow you to make a truly bespoke baby shower. There is a whole range of differing locations that present contrasting vibes for baby showers. You could rent out a luxury apartment in the city, in a high-rise building so you can sip wine and enjoy the view while your pregnant friend opens presents. You may find renting of a 40×60 steel building cost is less than a hall venue in a grand hotel, yet provides bigger room and more options for facilities, such as a band, outdoor play area for visiting children of other moms, and a large main room for a large guest list. Parallel to the seating arrangement, you could have tables set up with a buffet food offered to the attendees. If you’d rather do it at your own home, that’s a great decision too, because it’s more personal and provides you with a chance to show the mark of a great hostess. It’s pivotal to the select a theme that your friend will relate to and enjoy. It’s got to be expressive of their nature, or perhaps from a childhood memory, and possibly even a theme that’s reflective of their baby’s gender. The easiest way to lose a grip on the overall look and interior design of the party is to move forward with just a vague hint, perpetuating a stride with no clear direction. Set out the day and what you want to achieve. For example, the catering, you could start out with a light brunch, reminiscing about the past with a close, tight-knit bunch of friends. Next onto an afternoon tea or lunch, where each person could swap stories about the first time they had a child and exchange tips and tricks on how to cope with a newborn. Make sure you brief your guests before they come to shower, and inform them well in advance that gifts should be baby proof and practical and something that will be detrimental to raising a baby. Apparatus like a breast pump, advanced guide to the stress calls and crying a baby makes life hacks that will save her time and money with the proper planning advice, clothing for the baby such as hats, mittens, and footwear, etc. These gifts should be given to make the life of the pregnant woman easier and less stressful, so try to steer away from food items and makeup.